Grambling State dominates postseason awards. BIRMINGHAM, Ala. – The Southwestern Athletic Conference released its 2017 All-Conference Teams Thursday with 12 players from the SWAC West Division champions Grambling State being tabbed for the most individual honors. 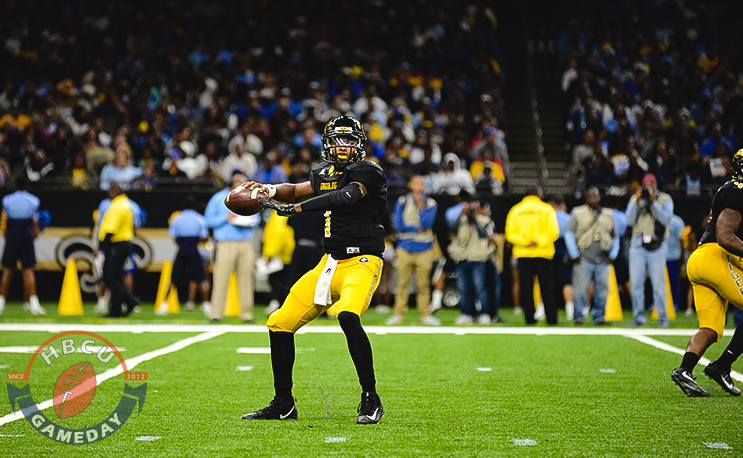 After helping lead the Tigers to a conference-best 10-win season, Grambling State quarterback DeVante Kincade was the voters’ choice for the SWAC Offensive Player of the Year award. Following up on his SWAC Preseason Offensive Player of the Year nod, Kincade completed 59.7 percent of his passes and threw for 2,409 yards with 19 touchdowns against just three interceptions. The senior held the top passing efficiency with a rating of 143.8. Additionally, Kincade accounted for the most total yards of offense as well with 2,649 yards. De’Arius Christmas was tabbed as the SWAC Defensive Player of the Year after he was ranked fourth in the conference in tackles with 76, third in the SWAC with 14.5 tackles for a loss, to go along with 3.5 sacks (18th in SWAC), and two forced fumbles (tied for fourth in SWAC). Mississippi Valley State junior transfer wide receiver Quinn McElfresh was named the SWAC Newcomer of the Year after leading the conference in receptions per game (5.2), was ranked second in receiving yards per game (80.8), led in receiving yards (889) and added five touchdowns. Prairie View A&M kicker Zach Elder was honored with the SWAC Freshman of the Year award after ranking tied for third in the conference in scoring (72 points) as he made 42-of-43 PATs and converted on 10-of-12 field goals. He led the SWAC in PAT percentage (97.7). Broderick Fobbs was dubbed the SWAC Coach of the Year after leading the Tigers to another double-digit win season and a third consecutive trip to the SWAC Championship. Grambling State lead the conference in points per game (32.0), was second in points allowed per game (19.4) and boosted the conference’s best run stopping defense (allowed 94.0 yards per game), most interceptions (16), most sacks (41) and one of the nation’s top turnover ratios (plus 21) as well as the SWAC’s top red zone offense (converted on 90 percent of chances). SWAC East Division winner Alcorn State had the second most amount of selections with nine, SWAC West Division runner up Southern and Prairie View A&M followed closely behind with eight selections apiece on the teams. Mississippi Valley State had four selections while Alabama A&M and Alabama State each garnered three selections apiece, Arkansas-Pine Bluff had two selections and Jackson State had one representative.